Pension Tones Jeseniky offers comfortable accommodation in two period-furnished apartments. Both apartments feature free Internet access. A apartment is located on the ground floor and has 6 fixed beds and 2 extra beds. Dressing room: bench, shoe cabinet, build-in cabinet. Kitchen with living room: bar table, chairs, beer tap, fireplace, solid fuel stove, beds, sofa, radio, color TV, table and benches, electric cooker, oven, fridge, kettle, microwave oven. Bathroom: toilet, shower, heater, washing machine, mirror cabinet. B apartment is located on the 1st floor of the house and has 4 fixed beds and 4 extra beds. 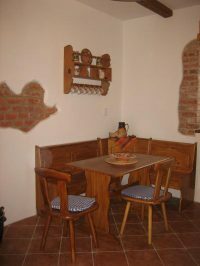 Hallway: table, 4 chairs, bench. Bathroom: WC, corner bath, 2 sinks, 2 mirrors. Kitchen: table, 4 chairs, shelves, electric stove, fridge, kettle, microwave oven. A room: beds, sofa, 2 rattan stool, coffee table. B room: beds, sofa, coffee table, colour TV, bar, 2 chairs.